In 2012 MIT Press celebrated it’s 50th anniversary, two years on we continue the celebration by marking the 50th anniversary of the logo (or colophon) designed by Muriel Cooper (1925 – May 26, 1994). In 1952, Cooper became a freelance designer at the Massachusetts Institute of Technology Office of Publications, which eventually would become MIT Press. She soon was appointed to head the Office, newly renamed to Design Services, which was one of the first university design programs in the US. In 1955, Cooper recruited graphic designer and fellow MassArt alumna Jacqueline Casey to her own lengthy career at MIT, where Casey designed many posters and smaller publications in a modernist style. Cooper and Casey, along with Ralph Coburn and Dietmar Winkler, would be influential in bringing modern Swiss-style typography to MIT Press. In 1958 she left to pursue a Fulbright scholarship in Milan, and returned to Boston, Massachusetts, in 1963 where Cooper opened an independent graphic studio. The MIT Press was among Cooper’s various clients, leading to her design of its iconic trademark colophon or logo, an abstract set of seven vertical bars. MIT Press Colophon designed by Muriel Cooper, 1964. ‘One color filled autumn day in 1962 two representatives of the Press motored down to Connecticut and there, somewhat to the amusement of their host, vigorously argued that he, perhaps the best known American typographic designer, should render advice and council to the MIT Press in design and typography. In retrospect the presumption of the request was met extraordinarily politely and while negatively, yet constructively. Thus it came to be that Paul Rand bade us return to Boston, contact Muriel Cooper, place before her the commission we had tendered him, and if all went well, achieve the desired ends of distinctive and appropriate graphic design of our books, our promotion pieces, our letterhead, our visible selves. Cooper carried out the branding and book design, with design assistant Lauri Rosser, along with all the Press’s materials, from letterhead, displays, and catalogs to brochures, labels, and advertising. The evolution of the Press colophon can be quickly seen in a detail from an early large-scale sketch by Cooper: from a geometric row of books upon a shelf, Cooper pulled one of them up so that it extended over the others, and then pulled the one next to it down, causing it to drop below the implied shelf in a reversed reflection of the book spine preceding it. These seven book spines would be flattened out graphically against a black square background to form the very abstracted lowercase letters ‘m i t p’. Cooper’s brainstorming sketches for MIT Press colophon. In 1967, Cooper returned to a full-time position as Design Director of the MIT Press. As the first Design Director of the MIT Press, Cooper established a comprehensive publishing program and designed books like The Bauhaus (1969) and Learning from Las Vegas (1972). Muriel Cooper for Robert Venturi, Denise Scott Brown, and Steven Izenour, A Significance for A&P Parking Lots, or Learning from Las Vegas (Cambridge: MIT Press, 1972). 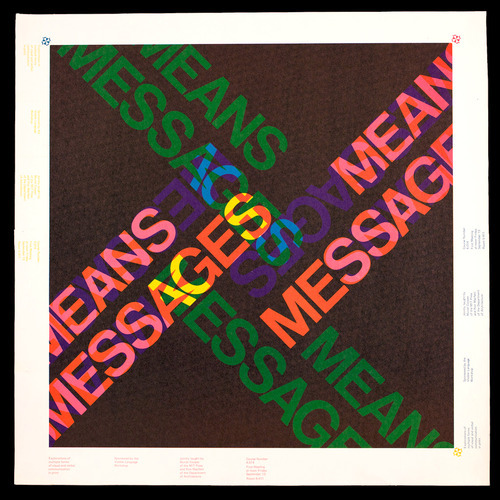 She maintained her position with the MIT Press until leaving in 1974 to begin teaching a course at MIT called ‘Messages and Means,’ exploring her interest in the intersection of typography, graphic design, and technology. 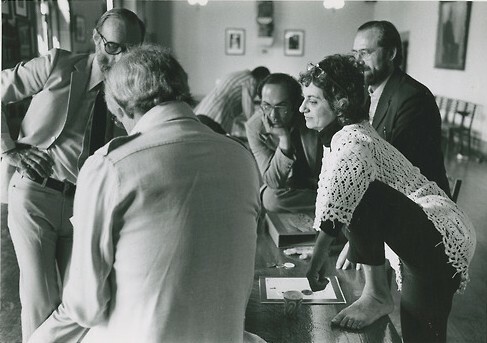 Muriel Cooper in conversation at MIT, 1970s. Design at the MIT Press has gone through a few generations of evolution over the decades since Cooper established the wide-ranging foundations in the mid-1960s. One of the first acts of branding she accomplished for the Press in 1964 has remained unchanged all of these years, and though it was accomplished a couple of years after the Press’s official birth, It remains one of the most successful, recognisable, and elegant publishing colophons today: seven book spines that in turn grace the spine of every book published by the MIT Press. Baseline has recently met with Roger L. Conover, Executive Editor of MIT Press, on a visit to Kent, UK.